Located in the heart of the Village on Church Street just south of Wellesley Street in Toronto, our friendly, caring dental team provides a range of dental services in a warm and welcoming environment. If you would like to book an appointment, or have any questions about our services or fees, call us or send us an email and someone from our team will get back to you. We are located on the second floor in the Church Wellesley Health Clinic. If you are HIV+, you may have particular concerns or questions about your oral health as it relates to your HIV status. Some common concerns are outlined below. Why should you choose an LGTBQ-positive dentist? When you are choosing a healthcare provider, including a dentist, your concerns should be your health. You should feel confident that you will be treated fairly and have your needs meet – that you won’t face discrimination or microaggressions in the office and at your appointments. 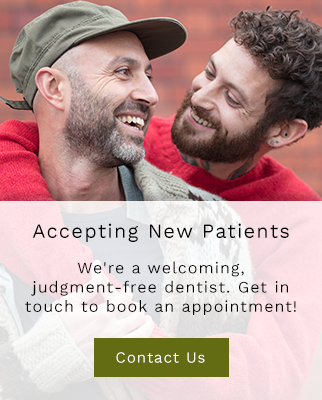 Book an appointment with the warm, welcoming team at Church Wellesley Dental Centre. At our downtown Toronto dental clinic, we can't wait to see you smile!